Once you have entered your first schedule, it is easy to create new schedules using the Import feature. 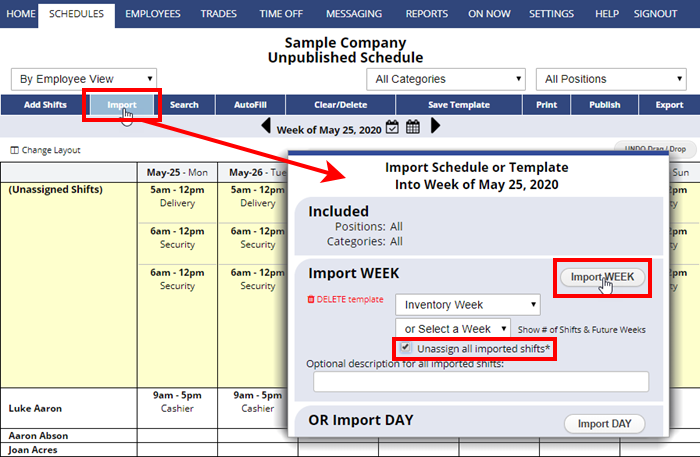 Import any previous week “as is” by choosing a date, or Import a saved template by choosing a template name. When Importing, you can check off to clear all the old work assignments and then AutoFill to get the best possible work assignments for the new week. When your schedule is ready you can Publish and you are done! You also can Import shifts for one day at a time by using the “Import a Day” in the bottom section of the Import window.